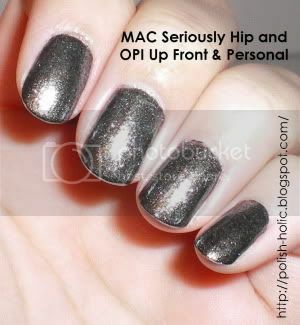 So I got sick of staring at MAC Seriously Hip's black soul and decided to add a layer of OPI's Up Front & Personal just to change it up. I absolutely love what I ended up with. It is now a beautiful green tinted, shimmery, gunmetal grey. Man, I adore it. I had considered adding a drop of Up Front to Seriously Hip, but the idea of frankening my $15 limited edition polish hurt my heart. I definitely love how this turned out instead.